The 14401001 Original Kettle is another great addition to Weber’s trusted lineup of outdoor cooking appliances. 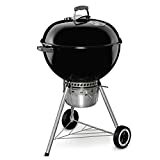 This grill boasts a classic American grill design, complete with a well fitted lid, charcoal grid and an expansive 22 inches of cooking space, making it a perfect appliance for outdoor grilling. The Original Kettle by Weber is easy to assemble and leaves no messy ashes owing to its aluminized steel One-Touch™ cleaning system. The Weber 14401001 Original Kettle grill arrives with a robust porcelain enameled lid and bowl, which provides excellent resilience to fire and won’t rust even after years of use in literally any weather. Adding to this, this superior material not only delivers a great grilling experience, but also significantly enhances the appeal of the product. One of the noteworthy features of the Weber 14401001 Original Kettle grill is its unique One-Touch™ cleaning system, which is fitted with a high capacity, removable, aluminum ash catcher, a damper control rod, H-Drive assembly and three damper blades. Located at the base of the unit, the One-Touch cleaning system and ash catcher make it easy to empty the bowl of ashes. To do this, simply slide the systems handle from side to side to move the three blades inside the kettle and dump the ashes accumulated inside the bowl into the ash catcher. For storing important cooking tools, the Weber 14401001 Original Kettle is fitted with a convenient shelf, which is located between the legs of the unit. With the hinged cooking grate, grilling aficionados can infuse more aroma and flavor into their creations without actually disturbing the grilling process. The revolutionary design of the cooking grate enables grillers to add wood and charcoal to the grill without actually lifting the food or even the lid of the Weber 14401001 Original Kettle grill. This plated steel cooking grate provides an expansive 2552cm² cooking space, which is more than enough to impress a sheer number of people and at any al fresco dining spot you choose. The onsite lid mounted thermometer is another real plus of the 14401001 Original Kettle grill, and simply takes the guesswork out of indirect grilling. It is designed to stay in place when the grill is in use for perfect grilling conditions, and is mated with a weather proof handle with a protective heat shield. The thermometer is firmly bolstered to the top of the lid to provide easy access without having to repeatedly open the grill and cutting into the meat. There is also a lid mounted aluminum vent that controls the airflow and temperature for superb result regardless of the foods that’s being cooked. The Weber 14401001 Original Kettle grill provides great mobility and can be moved anytime and anywhere you desire thanks to its foldable design, all-weather wheels and tow hooks to move the unit even when it’s hot. The Weber 14401001 Original Kettle grill is extremely easy to use for those just getting their feet wet with outdoor grilling, and is a preferred choice for seasoned grillers. The charcoal rails included with the grill are extremely useful for indirect cooking as they allow spacing of the coal or briquettes to circulate the heat around the food so whether you’re baking or roasting, the results won’t disappoint! The package also comes with a charcoal measuring cup so you know exactly how much charcoal is needed for the best results. The Weber 14401001 Original Kettle grill is backed by a 10 year warranty so you can rest assured it will last for years to come. Why you should get the Weber 14401001 Original Kettle grill? What’s not to like about the Weber 14401001 Original Kettle Grill? The Weber 14401001 Original Kettle grill is an extremely durable and affordable outdoor cooking unit. It is perfectly suited for big and small gatherings and outdoor functions. The circular design creates a convection cooking area, and the expansive interior space combined with excellent venting makes this grill one of the best in its it class.